Here’s another in-your-face summer memory, ZUCCHINI!!! Zucchini, zucchini everywhere, even in your underwear! Hahahaha. Honestly whatever possessed Patty (mom) to plant so much of it!? There surely was a lot of zucchini bread and a threat about zucchini ice cream from cousin Dave. Over the years I’ve found a new appreciation for zucchini’s subtly. I love it in Frank’s Grilled Veggie Dagwood and Emma’s favorite dish from Foodo last year, the Zucchini Cakes without Oil. This recipe is another tribute to the zucchini and one I’ve been making for years. Mix well and pour over squash. Seal bag and ‘massage’ to distribute evenly. Set aside while you make the dressing. Grill squash over medium heat, about 2-3 minutes on each side. Place on platter and drizzle with dressing. I love grilled squash, these look perfect. And the flavors f this dressing, tasty! Yum! I think this will suit eggplant too! MMMM… love zucchini and with all of these great flavors this sounds so good. I like the idea of adding some honey to the dressing…. I love honey..well who doesn’t? I grill summer squashes at least once a week. We love them ANd…they are so low cal and good for you. These look wonderful. The honey should give them a nice sticky glaze…really good! I love all the zucchini…it forces creative, new recipes like this one! Looks really good. I love zucchini but the rest of the family does not. I have to hide it so I can cook with it and they eat it. Have you tried the Zucchini Crusted Pizza from the 2nd Moosewood book? It used to be a standard of mine. The only way I could get my hubby to eat it. Covered with cheese and sauce he never knew it was in there. Yum! I love this! Just looks amazingly fresh and good! 🙂 I love grilled Zucchini too, doesn’t get much better! Ugh. I still avoid it whenever possible. Kori considers it a victory when I ingest it unwittingly – ground to mush in mashed potatoes, liquefied in the blender, or pulverized in a veggie burger. I used to have nightmares of Zucchini – O’s for breakfast, peeling bananas and finding zucchinis inside, and zucchini underwear. I still can’t eat the stuff. I think I may have over-zucchini’ed myself. This looks so good, but I don’t think I want to see another green squash until next summer. I have so much in the freezer grated for zucchini bread this summer. I will print this and save it though. It looks yummy. Zucchini and eggplant are my favorite foods to put on a grill. I’m a vegetarian so I usually grill veggies for myself. 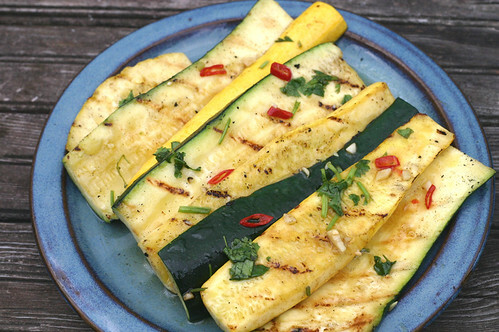 I love zucchini and squash on the grill! I often add egg plant as well. Interesting addition of cilantro – I need to give that a whirl! Sounds delish! I love the use of spices and the plastic bag trick. Thanks for sharing! This is great, I am always on the lookout for creative veggie grilling recipes to grill alongside steaks when we choose to do so. I love zucchini, this seems like a winner to me!